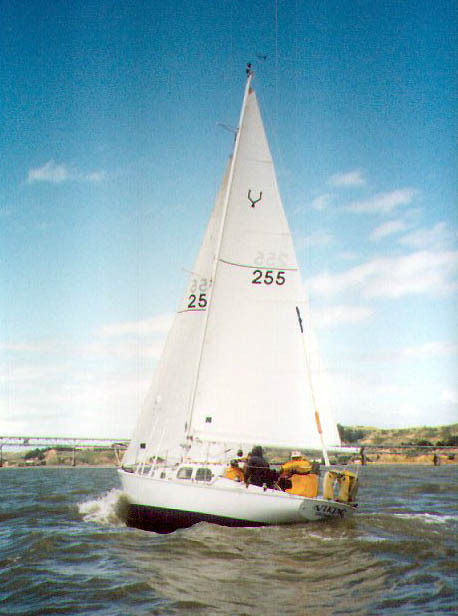 Enclosed you'll find a copy of the signup form for the umpteenth annual Plastic Classic Regatta. This is a race/regatta/great party for all Tritons (and other Plastic Classics as well). Working sails only, meaning main and working jib, makes this the perfect place for anyone who's ever toyed with racing or just wants to sail and socialize with other Tritons. For the first TODSF member to cross the finish line there's the Perpetual Trophy (someone pleeeeeez come beat Bolero!!). This annual event takes place just south of the Bay Bridge at the ultra-laid-back Bay View Boat Club. After the "race" there's a terrific party at the club. You can anchor just outside the club; raft-up with one of the other Tritons already there (like Dogstar which will be flying the big blue banner). A dingy of sorts will come and pick you up. Or spend a weekend in the city like some folks by renting a berth at South Beach Harbor. and then return to the Vallejo Yacht Club and spend the night. This all happens right in front of the yacht club....Last year we rafted up to Russ Taft's Cal 36 Shoji. Andy Shepard rigged an inverter so Tom Newton could hook-up his amplifier; there were a lot of drums and bells and gords all playing loud, bad music. Call Tom Newton at (707) 552-2325 for reservations at the Vallejo Yacht Club. With five races down, Bolero is listed on the YRA totals with five firsts, giving Ely & Co. a commanding lead for the season (Hey Sleepyhead, we thought you won the second race. What happened?). Webheads can find the results of Triton (and other) races in the YRA's results page at http://www.yra.org/results/odca/ or, soon, on the TODSF home page http://www.netcom.com/~suter/todsf.html . Meanwhile, the mystery continues. Where's Hooke? Will they allow Bolero to walk away with the season unscathed? Alex Cheng is looking for a used jib/geona. If you have a good one give him a call at 650-851-2200 alexc@tedas.com . Last newsletter Karl and Laura had returned from their Northwest voyage. Laura had just "told my Mother and Father that we weren't quite finished yet, that we wanted to sail down to the Mexican border. Well, friends, a grimmer pair you have never seen...."
We left San Francisco mid-November and arrived in San Diego on December 20. To the racers, this will seem ridiculous, but we enjoy piddling along. We made only two overnight hops and the trip down was quite pleasant and easy. Even Point Conception, which we passed in the middle of the night, was very quiet. We only went to Ensenada in Mexico, so I'm not qualified to make many statements about Mexican cruising. Canada's beautiful scenery had spoiled us so much that we couldn't work up any enthusiasm for making the trip down the Baja Peninsula and (confession) perhaps we were about ready to get off the boat. So after anchoring at Todas Santos Islands in an extinct volcano crater for a couple of days, we started homeward bound the end of January. On our trip north we stopped at about every place you could stop. In Oceanside, we visited with Chuck Calvert, Triton #528. He took us sightseeing and had us aboard for a super breakfast. At Dana Point, to our delight, the very first person we ran into was George Maxwell, Triton #592. It was his weekend to be club steward at Capistrano Y.C. and we enjoyed seeing his boat and chatting with him. We stayed five days at Catalina Island, in Long Beach anchored right on the bow of the Queen Mary and went poking into coves on the very interesting Santa Cruz Island. At this point, I would like to make a point for off-season cruising. While I didn't spend much time in a bikini, the weather wasn't all that bad. We never had any problem finding a place to tie up. The Yacht Clubs all welcomed us and had guest slips available. When we anchored, we generally had the cove to ourselves. We were fortunate in our trip up the coast, we had only one hop, around Point Sur, which was truly uncomfortable. But arriving in Montery and spending an evening with Phyllis VanFleet, Triton #92, even soothed that over. On March 25th we sailed back under the Golden Gate. So, after 3200 nautical miles and almost a year, we tied Arbenture up, back in the Delta brackwater. The boat, which I know you have all been dying to hear, never failed us once. Karl did do a valve job in Ventura but actually it was due for it. Off Washington and Oregon, when the going was really tough, the boat handled herself perfectly (I can't say that for myself). It is a perfect all-around boat, a super racer-- tough in rough seas-- comfy spending a lazy summer aboard. Those of us who own one and love it are clever indeed!